Members of the SIS group teach kids and families how to build a sustainable solar cooker reusing household materials. Joan Mendoza, Ximena Schmidt Rivera and Alejandro Gallego-Schmid from the SIS group held a workshop on how to build a solar cooker. 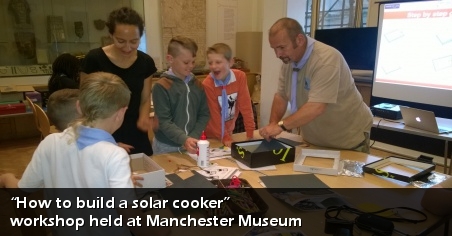 The workshop was held on 25 August 2016 at the Manchester Museum and was attended by more than 10 children, including a Scouts group from Reading in Surrey. The activity started with a brief introduction on what solar cookers are, how they work and the benefits for the environment and personal health. The children were interested in the idea of harvesting solar energy to heat or cook food. During the workshop, they built several solar cookers using materials easily found at home, such as old shoe boxes, newspapers, aluminium and plastic foil. The children were very excited by the solar cookers they built and willing to use them instead of conventional food heating devices. In summary, it was two hours of pure fun, where children and families learnt how they could contribute to sustainability by using renewable energy and reusing everyday household materials.